Each of the triple constraints (time, cost, scope) have a baseline, which is established as part of the overall project management plan. This is done during the planning process, and records what the project had planned, scheduled, budgeted for, in terms of the schedule, scope and cost. It should contain everything that the customer needs, as per the agreed scope. These three baselines put together are called the Performance Measurement Baseline. Once this is done, we get the key customers/stakeholders to agree to the baselines, and get them to sign-off. This, then, becomes the target of the project. You must make sure you deliver on or before time, on or under budget, but deliver the required scope, as per the baselines. No less, and no more! Period. Do not attempt to do any gold plating or giving extras to the customer. Gold plating does not add any value to the project, and only costs time and money on your part. PMI advises you to stay away from any gold plating. Once the baseline is created and signed off, it is not easy to change it. It can be changed, but the change must be approved by the change control board or the customer. You need to follow the entire change management process, and seek the required approvals before it can be changed. So it is not impossible to change a baseline, but it is difficult. And the project manager must guard against any changes done to the baselines without the change management process. In software packages like Microsoft Project, you can setup 11+ baselines to track cost and schedule. Thus, you can, at any time, track the performance of the project with the original baseline, or a modified timeline along the way. This way, you can see how good was your planning, and learn from the mistakes ( lessons learned). So having a baseline is a must, and you can take the help of the various project management software packages. There are many questions on the PMP exam, which will test your knowledge and understanding of the baselines. Questions on Scope Baseline will ask you about the components of the scope baseline. Questions on Schedule Baseline will test you on how to come up with the Schedule Baseline, and what is required to change it. For this, first you must have a realistic project schedule baseline. You must also know how to measure the progress on the schedule, using the Schedule Performance Index. You will also need to know about crashing, fast tracking, and calculating float. Questions on Cost Baseline will test your knowledge of various cost related terms, and control costs formulas used in Earned Value Management. A number of questions will also test you on how to make and manage changes to the baseline. For this, you must understand the Change Management process thoroughly. Be prepared for such questions. Practice as many questions as you can. You can join PMCHAMP’s Online PMP Coaching to get daily video training, and cover hundreds of questions with detailed answers. 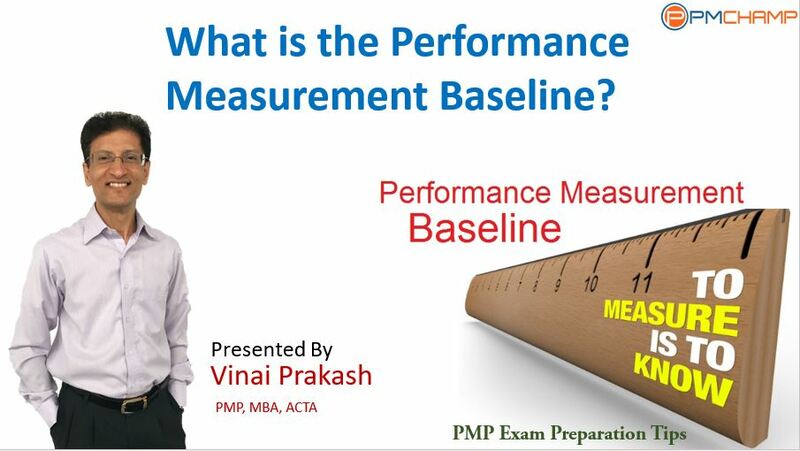 Let me know if you have any questions regarding the Performance Measurement Baseline for the PMP exam. You can simply post a comment below.